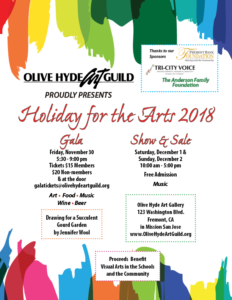 Olive Hyde Art Guild’s “Holiday for the Arts” Show & Sale benefits the Olive Hyde Art Gallery and other visual art projects in the Fremont community and schools. The show is held annually during the first weekend in December. The show opens with a ticketed Gala on Friday night featuring hors d’oeuvres, sweets, and wine, with the first viewing and sale of art. On Saturday and Sunday the show is open to the public without charge. The show weekend is always the first weekend in December. The Gala is held on Friday from 5:30 – 9:00 pm. Tickets are $15 for members, $20 for non-members. Tickets may be purchased at the door, or in advance. All tickets purchased at the door will be $20. Check back in October for more ticket purchase information. The show and sale are open Saturday and Sunday, from 10:00 am to 5:00 pm. Admission is free. 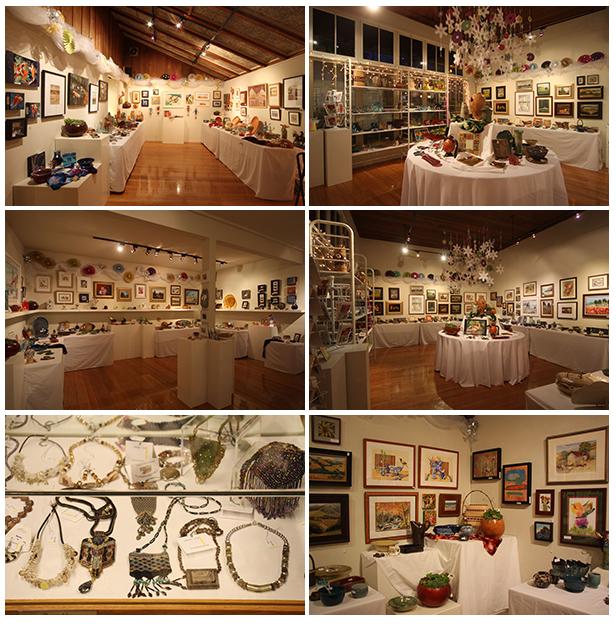 Items for sale include original works in ceramics & glass, paintings, jewelry, fiber art, wood products, sculpture, and holiday goods. We have many volunteer opportunities available for our annual Holiday Show & Sale. Sign-ups will be available in the fall.